We’ve often wondered with today’s busy lifestyles, how on earth you are supposed eat eight servings of fruit and vegetables each day. The Green Smoothie Bar has set out to change the way you think of fast food, and to show that you can eat healthy on the go and enjoy the taste of wholesome natural foods. “We are strong believers that prevention is the best medicine and believe eating more plant base foods and fruits and vegetables will have a big impact on the community and public health,” says owner Joe Accardi. With flavours like lemon ginger, mango peach and kiwi parsley you can beat the summer heat with a cool, refreshing green smoothie. We sat down with Joe to talk about phytonutrients, natural foods and getting your daily intake of fruits and vegetables. What did you do before you opened The Green Smoothie Bar? What inspired you to open up GSB? I was a property manager/owner at Red Brick Rentals, a property management company. My inspiration comes from my dad. His diet is so unique, he actually craves fruits and vegetables. As hard as it sounds he starts his morning everyday with greens usually boiled, whether they are spinach, broccoli or dandelion greens. What I learned from him is to use your diet as a tool to thrive everyday and live the most energetic life possible. What made you choose James Street North for the location? I think it is the uniqueness of the street that drew me in. Two to three story buildings, density but not inhumanly high buildings, wide sidewalks. I spend a lot of my time in this area anyways, with the festivals, restaurants and culture -- it is a wonderful, walkable area. The James North community has been extremely welcoming. What are the benefits of the smoothies you make? I think we're making it easy for everyone to eat their daily intake of fruits and vegetables. It is almost like a second generation multivitamin. We call it multivitamin 2.0 at GSB. The previous multivitamins were synthetic and man made. We have since found that when we incorporate plant based wholesome nutrients, they are much better than synthetic formulas for absorption into our bodies. On top of all this, natural foods have so many phytonutrients (10,000) that they have a positive effect on our bodies. They can't be duplicated in a synthetic multivitamin. 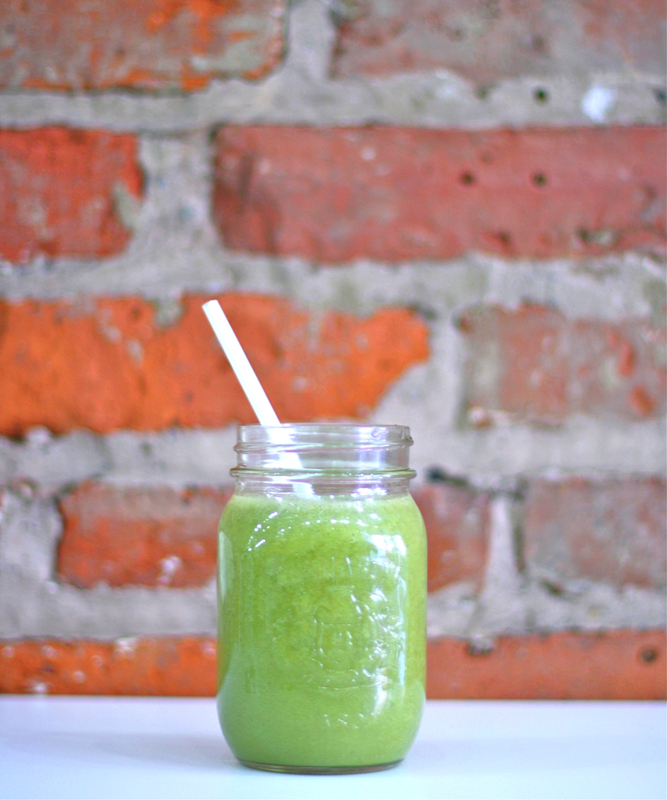 Green smoothies also incorporate important and well proportioned macro nutrients, like fiber, protein and healthy fats. Is kale really the new beef? Kale is extremely nutrient dense and has a wide array of phytonutrients. It is like a multivitamin on its own. It is part of the broccoli family, which has been shown in studies to have many health benefits on some of the most pressing health conditions in North America. For the average person, increasing consumption of kale and other leafy greens will improve their health. We put kale in all of our smoothies. Any tips you can offer for eating healthier? Eating healthy has to be fun so make sure the food you eat tastes excellent! Natural foods have so many great tastes... It is possible to eat healthy AND taste fantastic! Probably that my diet quality (and weight) has done the yo-yo thing a few times in my life. I think it was just too hard to eat healthy in certain situations/environments and my health and energy suffered because of it. Right now with GSB around it is so easy to eat healthy so I think the yo-yo is over. All leafy greens are amazing but if I had to say one it would be spinach. Not only is it the most nutrient dense food common to North America, but it is incredibly versatile. In the raw baby form it is slightly sweet which is great for smoothies and salads, and in the full grown form it has a mature taste, which is combined in so many classic recipes. It is also high in protein, fiber, phytonutrients, easy to find organic, affordable, creates no waste, and is a low carbon food. Heh, we always wondered before we opened how we would be able to control ourselves with Ola Bakery next door from us. Their Nata (custard tarts) can become too much of a good thing!